DRUG HISTORY: On Jun 27, 2012 a Man [was] Arrested for Smoking Marijuana in Library of Congress Cafeteria. Photo: Public domain. Image courtesy of the the White House via Wikimedia Commons. 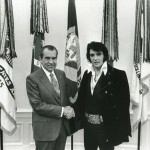 Richard Nixon asking celebrities such as Elvis Presley to come out in public as part of his fight against killer Drugs like Marijuana. Elvis should have taken his own advise. The Cost Of The War On Drugs.